Voicemail: comment about Orson Scott Card's opinion on the basis for JK Rowling's lawsuit; Will from Dallas has a recommendation on an addition to the e-book reader discussion; Jordan from Baltimore on the copyrights on CS Lewis work; CA Sizemore on publishing crap and non-crap; Lejon on the "based on a true story" tags; Snow Cat adds Ted Dickey as an author of a scifi-western series; Jack Jaffee on what might be beyond audiobooks and e-books; Jack on the "based on a true story" tag; Patrick has a complaint about FarPoint Media taking up too much of his reading leisure time; Darcy's Dad wants to hear more Lorrie on the show. 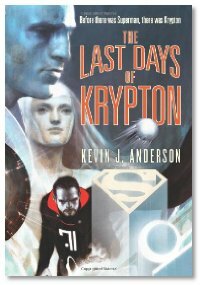 Listener Review: Tim Low, Darcy's Dad, brings us a review of The Last Days of Krypton by Kevin J. Anderson. The Library: Null-A Continuum by John C. Wright; The Alchemist's Code by Dave Duncan; Bring Down the Sun by Judith Tarr; The Edge of Reason by Melinda Snodgrass; Blood Noir by Laurell K. Hamilton; Requiem: Tributes to The Grand Master edited by Yoji Kondo.